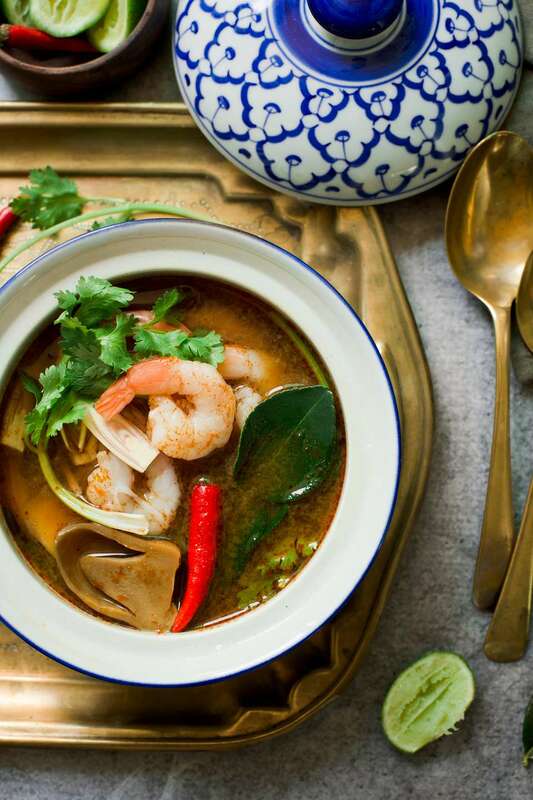 This Thai seafood soup is authentic and incredible tasting--you'll love the combination of seafood with lemongrass, coconut milk, and lime. This soup soothes and uplifts the spirit as well as the body. In Thailand, Tom Yum Talay is known for its health benefits and is the Thai equivalent of chicken noodle soup when you're feeling ill. It's also remarkably easy to make once you have the ingredients. If you have any trouble finding these ingredients, don't be put off making it--just try the recommended substitutions and it will still turn out great! Make this soup on a chilly fall or winter day and you'll soon feel thoroughly warmed from the inside out. Pour stock plus lemongrass and lime leaves in a deep soup pot over medium-high heat. If using fresh lemongrass, also add the upper stalk pieces for extra flavor. Bring to a boil. Add garlic, galangal or ginger, chili, and mushrooms (if using). Reduce heat to medium and simmer 2 to 3 minutes, or until mushrooms are soft. Add the shrimp, any other seafood you're using, tomato and baby bok choy (if using). Simmer over medium heat 3 to 4 minutes, or until shrimp turns pink and plump and mussels have opened. Scallops, crab, and fish should all be firm to the touch and no longer translucent. Reduce heat to medium-low and add the coconut milk, fish sauce, soy sauce, lime juice, and sugar. Stir well to combine and gently simmer until hot (do not boil at this point). Taste-test the soup for salt and spice, adding more fish sauce instead of salt (about 1 more tbsp. ), or more chili as desired. If too sour, add more sugar. If too spicy for your taste or if you'd like it creamier, add more ​coconut milk. If too salty, add another squeeze of lime juice. Serve in bowls with fresh coriander sprinkled over. For an extra hit of flavor, you can also add some Thai chili sauce, Nam Prik Pao, either store-bought or homemade.